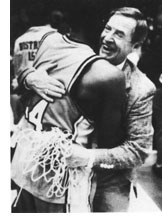 Van Scyoc coached the Manual Rams to a 31-3 record and second place in the Class AA state high school tournament, losing last March to Proviso East 68-61 in the championship game. The Rams were ranked No. 1 statewide throughout much of the season. The Rams captured the Mid-State 9 championship, Van Scyoc's 19th conference title in 44 years of coaching, and started their state tournament bid with a 93-57 regional victory over Streator. Morton, Woodruff, Central, Danville, Rock Island and Chicago Marshall were then beaten on the way to the finale at the Assembly Hall in Champaign. Van Scyoc-coached high school teams - at Hittle Township in Armington, Washington and Manual - came into February, 1992, with a record of 770 victories and 384 losses. His teams have won six of the last seven Pontiac Holiday Tournament titles. Van Scyoc has received eight Illinois Basketball Coaches Association "Coach of the Year" awards. He's a past member of the IHSA Basketball Advisory Board and a member of the IBCA Hall of Fame. The Rams came into this season with 10 consecutive years of 20 or more victories. Van Scyoc has coached nine teams to the ìSweet 16î and four teams in the Final Four at Champaign. Very few athletes had a high school career to match Howard Nathan. With a rainbow jumper and his high-top fade hairdo back in the`90s, Nathan epitomized the in-your-face, slap-the-floor defense that is a trademark of Peoria hoops. 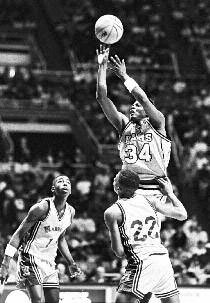 He led Manual high school to three Illinois state tournament appearances (1988, 90, 91). In his senior season he led Manual to a 2nd place finish. By playing the late quarterfinal Friday, Manual had to play three games in 23 hours, culminating in a championship loss that Saturday night. Nathan scored 19 points, 11 in the last 5 minutes. He finished his prep play with seven rebounds, six assists and two steals. He was tournament scoring leader, and his 13 3-point attempts are still a record for a title game. For his heroics, the Chicago Tribune crowned him Mr. Basketball for the state of Illinois, at 5-foot-10, then the shortest winner by 4 inches. Nathan was named to the 1991 Mc Donald’s all-American team. Nathan continued his career at DePaul University and University of Louisiana at Monroe. He left school early to become the first Peorian to play in the NBA as Howard appeared in five games for the Atlanta Hawks during two 10-day contracts in 1995, 96 season. He had 13 points, three steals, and two assists in the league. Back in Peoria Nathan’s basketball legend grew. His teams won five straight Gus Macker titles from 1998 to 2002. In July 2006, Howard was paralyzed in an automobile accident and confined to a wheelchair. Howard still continues to be involved today in basketball within the community.